Mackensie Alexander has had his ups-and-downs the first two seasons of his career, but he’s starting to show why he was one of the highest-graded cornerbacks in college in 2015. Alexander got his hands on a couple of passes while allowing a paltry two yards on four targets for the game. The Viking’ pass-rush was unstoppable. Not only did they rack up nine sacks, but they pressured Ryan Tannehill on more than 50% of his dropbacks. Danielle Hunter led the way with two sacks and multiple pressures while Anthony Barr also joined in on the fun with two sacks and several pressures. It was an efficient day for Kirk Cousins, as he often found the open receiver and completed the pass. It wasn’t flashy, as he attempted just one pass 20-plus yards downfield, but he completed it for a big-time throw and a touchdown. This was easily the best rushing game of the season for the Vikings, as they emphasized getting Dalvin Cook going. Cook carried 19 of the team’s 38 designed runs, as he benefited from good scheming and blocking gaining ample yards before first contact after coming into the game averaging just 1.7 yards per carry. It was a rough day for Tannehill. He missed on all four of his deep attempts and connected on just two of his six passes at the intermediate level. He was clearly rattled by the consistent pressure the Vikings’ defense was applying. Most will look at the box score stats and say the Dolphins needed to run the ball more often, but the running game was ineffective for 19 of their 20 attempts. It just happened to be that the one attempt it was effective for was a 75-yard touchdown run that saw some poor gap control from the Vikings’ defense. Take away the big run and 4.2 yards per carry is respectable, but when you give up 40-plus points, the running game won’t help. It was a rough afternoon for rookie Minkah Fitzpatrick outside of his pick-six. He allowed a ton of yards in coverage. He’ll get the highlights and probably an NFL rookie of the week nominee because of the one play, but he struggled the other 29 snaps he was in coverage. No one on the Dolphins’ defense stood out in a positive way. The Vikings roared out to a 21-point lead, and the defense started playing well enough until the game got away from them through poor coverage and run defense in the fourth quarter. The pass-rush was unable to take advantage of a Vikings offensive line that has been porous all season long. A change in offensive coordinator seems to have rejuvenated a stagnant offense, as Cousins mostly nickel and dimed the Dolphins’ defense with a good mixture of the run game. 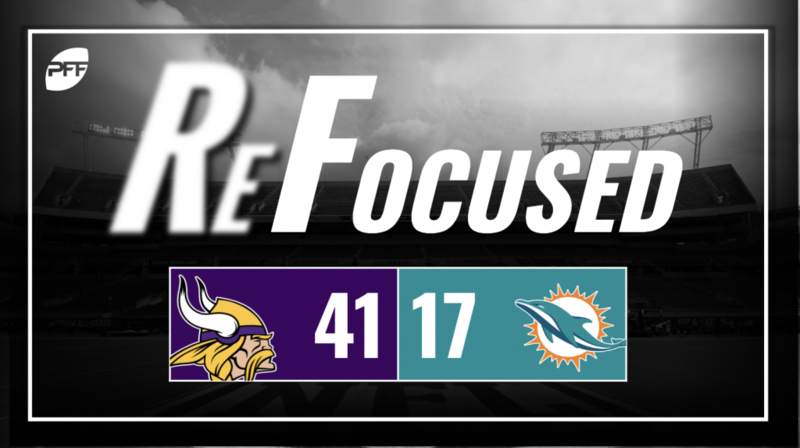 The Dolphins’ offensive line and pass-protecting unit struggled to keep the Vikings’ front seven at bay, leading to a disastrous day from the quarterback position.